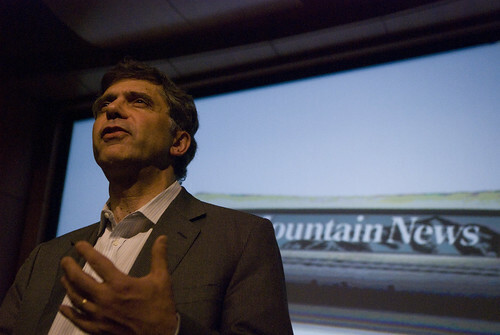 After 150 years, existing longer than the city it serves, longer than the state of Colorado itself, the Rocky Mountain News is closing its doors. Publisher John Temple gave its eulogy in a press conference today at the Denver Newspaper Agency. He told the press that “We had hoped to find a solution, any solution other than this.” Temple revealed that the Scripps company, which owns the Rocky, had no offers in the search for a buyer which began in December. When the presses shut down tonight, the Denver Post will be the only major newspaper in Colorado. The Rocky, whose photo staff won four Pulitzer Prizes since 2000, whose pages were graced by the likes of Damon Runyon, Gene Amole and Dusty Saunders, who has covered everything from the Big Thompson flood to the moon landing, to the statehood of Colorado itself, will cease to exist after tomorrow. Denver will not be the same without the Rocky. She will be sorely missed by all who ever read her pages. Intrinsically a part of the city of Denver as well as the state of Colorado, the Rocky weathered the Civil War as well as two world wars, the Great Depression, and the rise of television news. 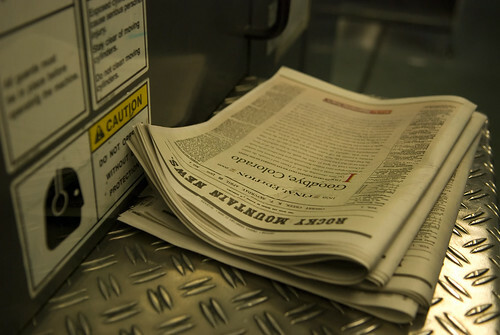 And now, with the global economy in turmoil and the newspaper industry facing mounting casualties such as the Seattle Post-Intelligencer and the San Francisco Chronicle, the Rocky must bow out. This video that was created by staffers (IIRC) is incredible. I’m not sad to see a news paper die, but it’s sad to see so many people hit so hard, and in such sucky times. No one should be in that position, especially now, and sadly, especially news paper journalists.